" Provided you don't cover the bowl and allow condensation to drop in, microwaves can be very effective at melting chocolate as they eliminate the risk of seizing it with liquid. 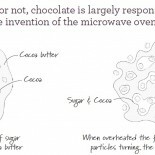 However, chocolate's low melting point means you have to heat it gently to prevent it overheating, which in most microwaves means keeping your eye on it and stopping to stir every 30 seconds. The Breville Quick Touch has a 'Melt Chocolate' setting which calculates the correct power level and time based on how much chocolate you are using so you don't have to stay glued to the microwave. Because chocolate is a poor conductor of heat you will notice a few semi-formed pieces in the bowl at the end of the cycle which can be combined by stirring with a metal spoon". 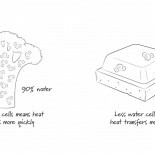 Heat lower water content foods like chocolate on much lower power settings. Make sure you select an appropriate power level for the ingredients you’re cooking and adjust the power level when necessary. Some microwaves make adjusting power quite tricky. But, the Breville Quick Touch™ lets you adjust power and time at any stage during the cooking cycle, simply by turning a dial. Sounds so simple yet you’ll be surprised what a difference it makes!